Use of food groups including seafood, poultry, meat, cheese, fruit, vegetables, salads and dressings etc. Cold Larder - platter, plate, bowl and mirror work. Basic set up, garnishes etc. Print the CD to provide a working manual for the kitchen and worksheets for staff usage. Brilliant for the person doing canapes for a Wedding, Cocktail Party, Birthday, Social function etc. From Mise en Place, shopping list, worksheets to final presentation, plus party fruit, sandwiches, nori rolls, Australiana, etc. Everything you wanted to know about Canapes is in the Kazbar's Party Time Catering CD with over 35 colour pages of just canapes. Hot Hors D'Oeuvres - from ingredients to final mouth-watering platter presentation featuring home-made mini quiches, pizzas, chicken dishes. Cocktail party menu examples are given with the tips that make the party complete! Includes preparation, work sheets, cheeses, meat mirrors, platters & plates, ham showpiece, chicken & cold meats, anti pasto, seafood & fruit, with hundreds of colour photos, tips and ideas, etc. Covers basic everyday salads, gourmet salads, dressing, work sheets, presentation ideas, recipes for salads and dressings, etc. 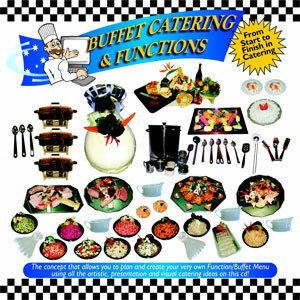 Step-by-step, from the customer's menu selection, through to final full colour buffet with all the planning, costing, mise en place, work sheets, menu ideas, bain marie & chafing dishes, including full colour photos.